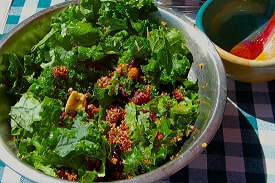 Combine the kale, quinoa, almonds, raisins and cranberries in a bowl and mix. Whisk together the MOV oil and vinegar, season with salt and pepper. Drizzle half the dressing over the salad and toss to coat. Cut the beets and avocado, and oranges into bite-sized pieces and add to the salad. Toss and add more dressing.